On Saturday, state #5 in my quest for 50 officially entered the books….. or map, really. If you ever plan to do the Carolina Century, bring a friend, or make sure you really like your own company, because those are your two choices. This ride is SMALL, in terms of participation, but a great event in terms of everything else. It takes place in the rolling Piedmont, just north of Greensboro, North Carolina. I’m not sure there were 100 participants total, across the five different mileages, which means I rode almost the entire 102 miles completely only. Luckily, I’m one of those who does happen to enjoy my own company, most of the time. If I saw 15 other riders during my 6 hours of riding I’d be surprised and the vast majority of those were at the plethora of rest stops. One thing about this ride is you will NOT go hungry or thirsty. I believe there were at least 8 rest stops on the 102 mile course. Perhaps the most impressive thing was the three or four folks on rollerblades. Apparently that is still big in some areas, and this must be one of them. My helmet’s off to these hearty souls, attempting to skate 102 miles, on certainly not flat terrain. Now THAT’S crazy. That you could even attempt to skate this event will tell you everything you need to know about the road conditions. This was 102 miles of near perfect roads. Despite being all primary or secondary roads, the traffic was low and the scenery throughout was bucolic. So, it was a wonderful day of riding, except…………. I have Shimano Di2 Ultegra electronic shifting on my bike. Let me say up front, I LOVE IT!!! I’m not sure I will ever own another road bike without this. It seems a minor thing, but it’s shifting performance is exceptional and you really do get used to just tapping the button. So much so that once you get used to the Di2, riding a bike with mechanical shifting seems somewhat a chore and rather clunky. I know, how “roadie” of me. ANYWAY…………… it works great, until………. the battery dies. The battery lasts a long time. When I first got it I went nearly a year without having to charge the battery. I’ve not run it down fully since then, but generally go a few months between charges. It’s been 2-3 months since I remember charging it last, but it could be more. The system is rather ingenious. When the battery begins to get low, the first indication is that it will take several taps on the button to move the front derailleur. That essentially indicates you have one, maybe two, chainring shifts remaining. The rear derailleur will continue to operate until the batter dies completely, which is advertised as at least a couple hundred more shifts. At mile 60, I got the tell tale sign shifting from the low to high chainring. Uh oh. I’ve got a long way to go yet not to have all my gears. But no biggie, I knew there weren’t any real killer hills. At mile 63 I down shifted in to the small chainring, figuring that was better than being stuck in the large. I’m glad I did because some of the later hills ended up a bit tougher than I’d been anticipating. Now I just had to get used to the forced difference in my cadence capacity and accept that I wasn’t going to pedal much faster than 21 mph and not at all on downhills. At mile 85, the battery was extremely tired, much like the direction my legs were heading, and my rear derailleur was cooperating maybe every 4th or 5th time I tried to shift gears. With 17 miles left I was now very stingy with my attempted shifts and limited myself to my middle 3 or 4 rear cogs. And finally, at about mile 99, she gave out completely. Trust me, I must have hit that shift button 30 times in the last few miles trying to get just one more shift, more for the principle of it than the need for another gear. I can manage to turn the most idyllic of days in to an adventure. But fear not, I finished, felt quite good and had a wonderful day in the Carolina Piedmont. 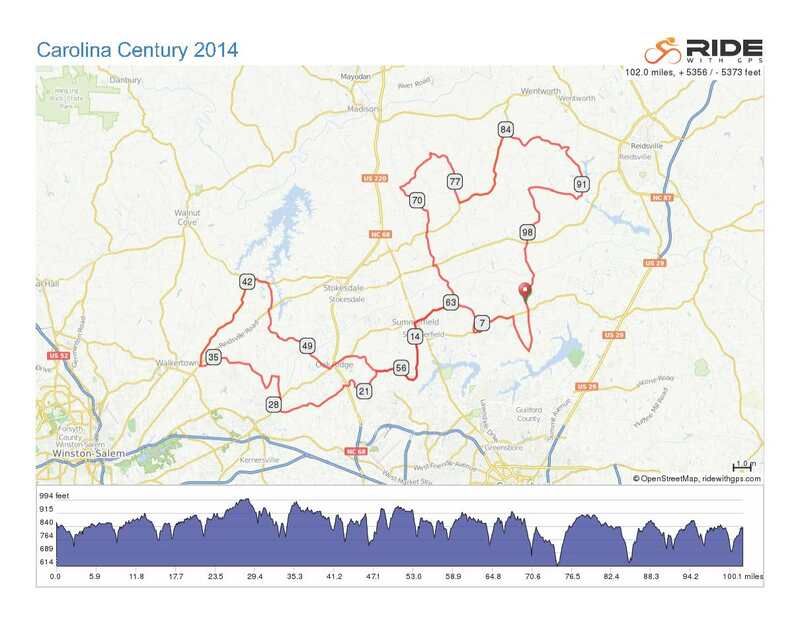 Thanks for coming to Carolina Century 2014! We had 160 participants but with 2 main start times and optional flex start, I agree we need more participants. We had four skaters complete the 102, the fastest in 7h38m, the slowest, me, in 10h16m. We also had 1 skater complete the roughly 70 miler, 2 complete the 49, 1 finish at a rest stop after “only” 41! Thank you for your kind words. We always fall short of perfection, but will always try to keep our promises…and will fail at that sometimes. Most of all, we try to remember we do this for people with multiple sclerosis first, then for an epic ride for as many as we can support from sunup to sundown, second, and for the love of each other as we volunteer and participate, as well. How great to be a part of your 50 states quest! What is the date for your 2018 ride? I would love to rude with you. Thanks for riding with us this year. Good luck and be safe on your quest for all 50 states. I managed to ride with a friend for the last 50 miles so I didn’t ride the entire century alone. I thought it was a great day and a great ride, but I am a little prejudiced since I consider Carolina Century my “home” ride.. I am not a rider or skater, but I have helped Margaret cater the chili and grilled cheese for about 5 years now. I also make the annual cake to commemorate the ride and Blake’s mother’s birthday. We look forward to serving you some great grub next year. Thank you for supporting the Carolina Century and the MS Society.